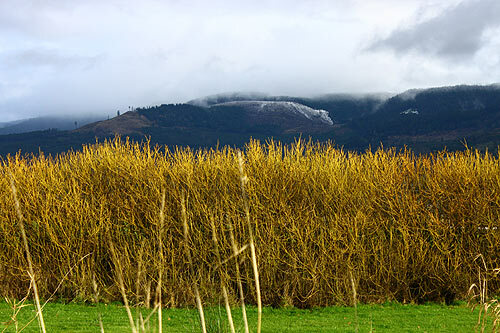 (Corvallis, Oregon) – A report released Tuesday that was penned by various scientists around the U.S. seems to point to increased climate problems in Oregon’s future, such as greater wildfire risk, summer water shortages, more extreme weather events, and a myriad of economic challenges because of these elements (photo above: near Eugene). The first Oregon Climate Assessment Report was released Tuesday, put together by 70 authors from universities, state and federal agencies and other groups, produced by the Oregon Climate Change Research Institute, an Oregon University System entity housed at Oregon State University. The report also points out new environmental responses to climate change as well as opportunities. Many of the issues addressed directly or indirectly affect tourism in this state. The legislatively mandated report was delivered Tuesday to Oregon Gov. Ted Kulongoski, Sen. President Peter Courtney, and House Speaker Dave Hunt. The 400-plus page report is available online at: www.occri.net/ocar. Kathie Dello, a research associate with the Oregon Climate Change Research Institute, coordinated production of the report with the help of nine lead authors and peer-review panels. The report examines the potential social, physical and biological responses to an Oregon climate that may increase in average temperature from 0.2 to 1.0 degrees Fahrenheit per decade through the 21st century, the authors note. A key variable to these and other changes are global greenhouse gas emissions that will influence Oregon’s future climate. “The key ‘drivers’ of emissions are population, consumption and the emission intensity of the economy,” Dello said. Oregon’s supply of fresh water may be one of the most critical components of climate change. A compilation of different climate models suggests that the state’s average summer precipitation will decline by about 14 percent by the year 2080, but the impacts will vary over time and space, said Heejun Chang, a Portland State University geographer and hydrologist who led the section on freshwater resources. “In terms of water supply, some lower Willamette River sub-basins – including the Tualatin, Clackamas and Molalla rivers, where population is growing – are more vulnerable to climate change,” Chang pointed out. “And with reduced summer precipitation, summer flow is projected to decline in the Western Cascade regions, which in turn will increase stream temperatures and further stress cold-water fish species. The Oregon Climate Assessment Report is partly modeled on similar reports produced in Washington and California, but covers new ground, including greater emphasis on the marine environment, on fish and wildlife, and on human dimensions, Mote said. Increases in ocean temperatures and acidification likely will further disrupt marine ecosystems and could lead to more near-shore hypoxia and so-called “dead zones,” harmful algal blooms, invasive species, and challenges for shellfish and other sea creatures, the report concluded. Oregon’s coastal region also will be subjected to more intense storms and higher waves, creating a greater risk of flooding. Drawing on research from the University of Washington, the authors say that wildfire is projected to increase in all forest types in the coming decades because of warmer, drier summers and an increase in fuel. “Large fires could become more common in western Oregon forests,” the report concludes. The authors say the largest data gap facing Oregon decision-makers is economic research. Some preliminary studies, based on individual sectors such as Oregon’s ski industry, have been started, Mote said, but large-scale “macro-economics” research is lacking. “We know that Oregon’s low-elevation ski resorts will be affected first by changes in precipitation,” Mote said. “And economists could quantify how much they will lose with each week of a shorter ski season. What is missing is detailed analysis of the pros and cons of climate change for the whole of Oregon. If we manufacture fewer parkas, do we make more swimsuits? As we lose some crops, do we grow others? The report includes lead and contributing authors from OSU, PSU, University of Oregon, the U.S. Forest Service, the U.S. Geological Survey, Oregon Department of Fish and Wildlife, Oregon Department of Agriculture and others.